Purpose of activity: To learn about a large variety of worms, including round worms, flat worms, annelids (earthworms, leeches and marine polychaetes) as well as some worms that are considered “minor phyla” such as the acorn worm, the horsehair worm and the peanut worm. 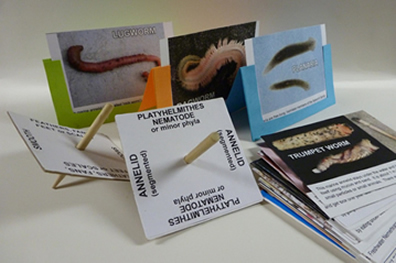 Description of activity: There are 24 pictures cards showing each kind of worm along with a brief description of the worm. There are also paper “cages” that look like colorful picture frames, and four spinners. There are two games you can play with the cards. In the first game, players work as teams to try to collect specimens for their worm zoos. The spinners will dictate what type of specimen can be collected. Players must use the information on the cards to determine which worms, if any, can be added to their zoo on that turn. The second game is a straightforward memory game that challenges players to figure out which worm has escaped from the zoo. This second game was found to be very effective in motivating players to focus their attention on the worms and learn their names. Simple yet very effective! Time allowance: Can fill any amount of time. NOTE: This file is a bit large because of the number of color photos. It might take a minute or two to download.